Adam Goldberg's hit ABC comedy show will air the episode dedicated to the Philadelphia Eagles' Super Bowl win next week. The episode will air at 8 p.m. Wednesday and features longtime Eagles broadcaster Merrill Reese and his partner in the radio booth, Mike Quick. Eagles General Manager Howie Roseman and President Don Smolenski will also make cameos in the episode, according to a press release. The group filmed their appearances with the cast of "The Goldbergs" during the Eagles' trip to Los Angeles in December. 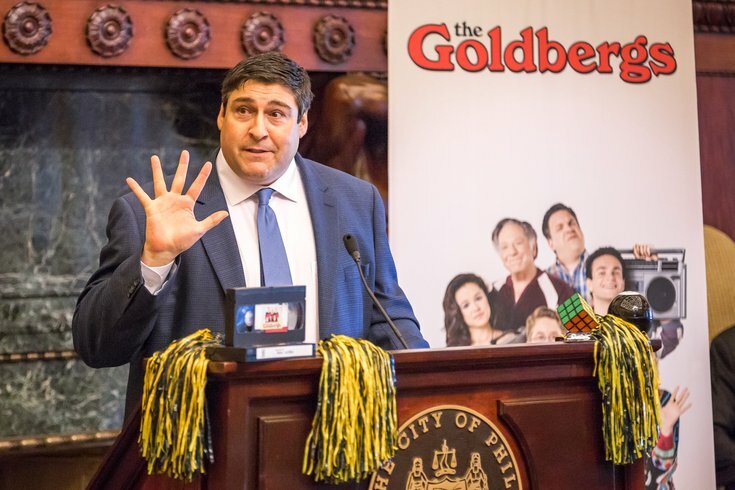 The show, which was inspired by Goldberg's Jenkintown upbringing and centers on a family living in a Philly suburb in the 1980s, will integrate '80s references in the episode such as the Eagles' 1988 rap video, “Buddy’s Watchin’ You,” the Chicago Bears’ “Super Bowl Shuffle” and a Nintendo game featuring a showdown between the Eagles and the New England Patriots. The cast will gather for an "E-A-G-L-E-S, Eagles" chant at the end of the episode, the show said.